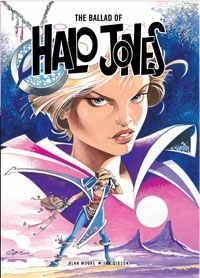 2000 AD is proud to present the all-time classic Feminist space Opera The Ballard of Halo Jones, written by comics legend Alan Moore (Watchmen, The League of Extraordinary Gentlemen) and drawn by Ian Gibson (Robo-Hunter, Star Wars). When Halo Jones grows bored with her life in The Hoop — a futuristic world where jobs are scarce and excitement is nonexistent — she sets out to see the galaxy any way she can. But can she survive the highs and lows that lie in her path, including an extended period of ship-board servitude and a tour of duty in a terrifying war that defies the physics of space and time? Originally serialised in 2000 AD Progs 376-385, 405-415, 451-466.